Fieldwalking and metal detecting has recovered a variety of finds dating from the Mesolithic to the post medieval period including many Late Bronze Age copper alloy items and metal working waste from a metalworker's hoard. Excavation of the area around the hoard suggests the items were placed carefully in a structured deposit. 1951 to 1956. Stray Find. 1 Neolithic polished stone axe (Coll. No. 3). Fragment of cutting edge. Found at TL 6995 9248. See copy of illustration in file (S3), which also notes that the axe was probably Cornish edipiorite. Previously recorded as NHER 5177. Amended by P. Watkins (HES), 21 October 2013. 1 Neolithic leaf shaped arrowhead. Windmill Hill type. Information from (S4). Flints, Iron Age, medieval, Roman, and undated pot, pot boilers. For full details of wares, flint types etc see (S5). Late Bronze Age possible hoard (S6 and S7), Roman brooch and pottery, Bronze Age copper alloy cakes (S8, S9, and S10), Middle Bronze Age palstave (S11) and Late Bronze Age axes (S12, S13, S14 and S15) found. Late Bronze Age socketed axe fragment fresh from chalk, (S16). For full details of all finds see file. E. Rose (NLA), 14 December 1995. March 1994. Metal detecting. Context 6. Roman brooch fragment 10m west of Late Bronze Age hoard area. W. Milligan (NCM), 10 March 1994. Middle Bronze Age blade fragment from palstave?, (S21). Before 4 April 2000. Metal detecting. Late Bronze Age gouge and knife or miniature dirk. A. Rogerson (NLA), 11 December 2000. 12 April 2000. Field observation. See P. A. Robins' (NAU) description in file. 1st century AD plate brooch. A. Rogerson (NLA), 20 June 2005. Before 7 February 2007. Metal detection. Fragment of Late Bronze Age socketed axe (S22) (found some distance from 1992 hoard) and medieval weight. Part of a late Bronze Age socketed chisel (S23). A. Rogerson (HES), 5 January 2012. --- Fieldwork: Fenland Survey. FWL 85. FENS. --- Fieldwork: Fenland Survey. FWL 86. FENS. --- Fieldwork: Fenland Survey. FWL CD. FENS. <S1> Thesis: Healy, F.. 1978. The Neolithic in Norfolk. pp 182-183. <S2> Monograph: Healy, F. 1996. The Fenland Project, Number 11: The Wissey Embayment: Evidence for pre-Iron Age Occupation. East Anglian Archaeology. No 78. Microfiche. <S3> Illustration: Derbyshire, D. Unknown. Drawing of a Neolithic polished stone axe.. Paper. 1:1. <S6> Illustration: Unknown. 1992. 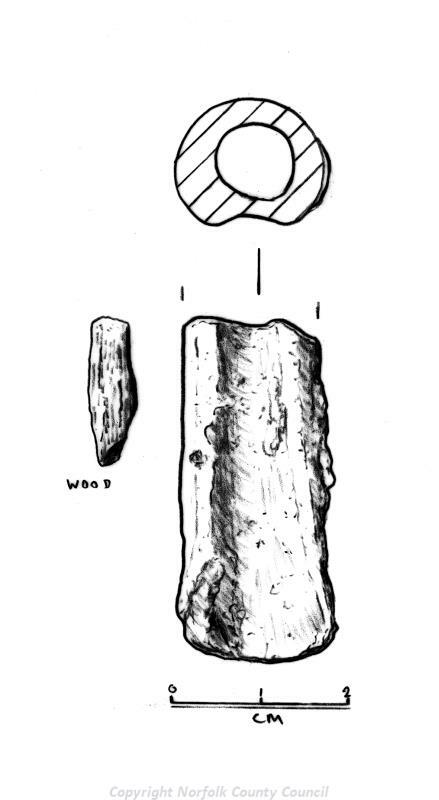 Sketch of a Late Bronze Age chisel with a piece of wood in the socket.. Paper. 1:1. <S7> Illustration: Unknown. 1992. Sketch of a Late Bronze Age chisel with a piece of wood in the socket.. Paper. 1:1. <S8> Illustration: Jones, C.. 1992. Drawing of a Bronze Age complete copper alloy cake disc.. Paper. 1:1. <S9> Illustration: Jones, C.. 1992. Drawing of a Bronze Age complete copper alloy cake segment.. Paper. 1:1. <S10> Illustration: Jones, C.. 1992. Drawing of a Bronze Age complete copper alloy cake segment.. Paper. 1:1. <S11> Illustration: Jones, C.. 1992. Drawing of a Middle Bronze Age palstave.. Paper. 1:1. <S12> Illustration: Jones, C.. 1992. Drawing of a Late Bronze Age socketed axe.. Paper. 1:1. <S13> Illustration: Jones, C.. 1992. Drawing of a Late Bronze Age socketed axe.. Paper. 1:1. <S14> Illustration: Jones, C.. 1992. Drawing of a Late Bronze Age socketed axe.. Paper. 1:1. <S15> Illustration: Jones, C.. 1992. Drawing of a Late Bronze Age socketed axe.. Paper. 1:1. <S16> Illustration: Birdsall, J.. 1993. Drawing of a Late Bronze Age socketed axe fragment.. Paper. 1:1. <S17> Illustration: Jones, C.. 1993. Drawing of a Late Bronze Age mortising chisel.. Paper. 1:1. <S18> Illustration: Jones, C.. 1993. Drawing of a Late Bronze Age socketed knife.. Paper. 1:1. <S19> Illustration: Jones, C.. 1993. Drawing of a Late Bronze Age gauge.. Paper. 1:1. <S20> Illustration: Jones, C.. 1993. Drawing of a Late Bronze Age awl.. Paper. 1:1. <S21> Illustration: Ashley, S.. 1995. Drawing of a Middle Bronze Age palstave fragment.. Film. 1:1. <S22> Illustration: Gibbons, J.. 2007. Drawing of a Late Bronze Age socketed axe fragment.. Film. 1:1. <S23> Illustration: Gibbons, J.. 2012. Drawing of part of a Late Bronze copper alloy socketed chisel.. Film. 1:1.